For business owners, accounting is a necessary evil. It’s uncomfortable because, generally, it’s outside of the owner’s area of expertise. When you look ahead at all the ways you want to invest in your business, staffing up the accounting function is probably not on that list. 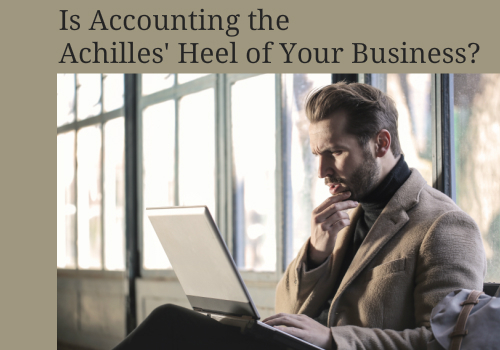 Is Accounting the Achilles’ Heel of Your Business? For business owners, accounting is a necessary evil. It’s uncomfortable because, generally, it’s outside of the owner’s area of expertise. When you look ahead at all the ways you want to invest in your business, staffing up the accounting function is probably not on that list. As much as you don’t want to deal with it, financial accounting can’t be ignored: there’s the necessity of managing cash flow, paying taxes, funding R&D, buying equipment, and paying employees to name just a few. Business sustainability depends on financial health. Maintaining financial health requires disciplined accounting practices as well as sound decisions – decisions that prevent money from being lost or capitalizing on opportunities that provide additional revenues and profits. What’s the best method of getting an objective look and helpful advice? We recommend a Finance Diagnostic Assessment (FDA). Unalp CPA Group comes on site to evaluate every aspect of your accounting: people, processes, and technology. Our on site evaluation generally takes one or two days (though it could be more depending on the size and complexity of your organizations). If you choose to continue to work with us to execute an action plan – that’s great. But the Unalp FDA was designed to assist you whether or not you go forward with us. We help you itemize the problem areas and give you a variety of possible solutions to address the challenges – we’re not trying to shoe-horn you into a single course of action. The Unalp CPA Group Finance Diagnostic Assessment was develop by attorney Jeffrey Unalp, CPA. As a business owner himself, he understands the value of clearly defined priorities and option. Which action items should be the priority? Where should we make an investment – people or technology? Armed with the findings of the Unalp CPA Group Finance Diagnostic Assessment, you now have the answers. Let us help you see how the plan would unfold. We recommend options, affordable options, that you may not have realized were available. Because we work with a variety of businesses and technology solutions, we can make a reasonable, affordable recommendation.